Behold, my parents come from Israel with images of Armageddon! Not the image you were expecting? Me neither. As it turns out the word Armageddon is a mondegreen. An accidental turn of a phrase. 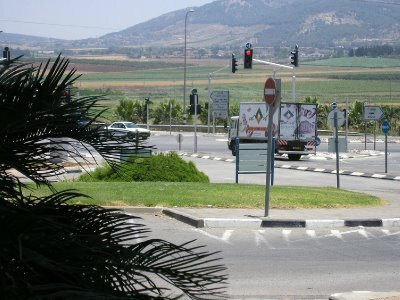 When Revelation refers to Armageddon it is actually referring to the above valley called Megiddo. The valley plain of Megiddo is where the unholy trinity of the Dragon, the Beast, and the False Prophet will gather their armies for the second to last battle. This is the battle where the Beast and False Prophet are defeated. The Dragon is only caged for a thousand years, or the Millennium. Anyway, the real final battle will occur at Jerusalem. The Dragon is finally defeated, but the battle destroys all of creation as well. Not to worry, a new earth is soon created. I wonder if the new creation will take the full 7 days, or if God will get it done sooner since he's done it before. Practice makes perfect. God then creates a new holy city on Earth where he will live, because even God knows that Earth is the place to party. "When Revelation refers to Armageddon it is actually referring to the above valley called Megiddo." Bingo! You win the door prize. Read on to grasp it. Here's the key to proving that the rapture and related expectations are complete nonsense based on the failure to understand (and the purposeful confounding of) the ancient Hebrew symbology used to construct all of these prophecies. Consequently, Christian timelines and interpretations of these prophecies are verifiably wrong on many key points. Did you ever consider that Christianity is the False Prophet symbolized in the Apocalypse, that Rome (Vatican/Papacy) is the so-called anti-messiah, and Jesus Christ is the false messiah? I have produced stunning and comprehensive proof that this is the true interpretation of pivotal prophecies long confounded by Christianity's founders and leaders. Recasting the symbolism of earlier Hebrew texts as literal events in the New Testament is one of the central deceptions associated with Christianity. The symbolism of seven years (tribulation, etc.) refers to seven 360-year cycles on the Hebrew calendar. Ezekiel 39.9 is referring to the 10th to 16th cycles inclusive, while the Apocalypse symbolizes the 11th cycle (second temple period) until now, the beginning of the 17th cycle (seventh angel/star/seal, etc.). Greece (Alexander the Great) conquered the Persian Empire and Judea during the 10th cycle and Rome did so again during the 11th cycle. Both Ezekiel and the Apocalypse are symbolizing an overlapping period of time that starts during ancient Judea and ends now. Gog refers to Greco-Romans (...from the "isles"), which means Magog is Eurasia and the "army" that besets "Israel" for seven "years" refers to the activities of the nations of the Greco-Roman/Vatican Empire over the previous two-plus millennia. It is completely wrong to interpret any of these prophecies as literal timelines and events. Unlike Christian assertions, they symbolize long periods of time, pivotal situations, and the flow of acivities during that period. Remember, they were written by ancient Hebrew sages, not Romans or other Europeans, and Revelation is the most symbolic of all prophecies. Consequently, in this context, "years" and "times" are symbols for 360-year cycles on the Hebrew calendar and days symbolize literal years. Therefore "Judgement Day," "Great Day" and "in that day" all refer to a literal year-long period. Accordingly, the so-called "Seven Years Tribulation" began in ancient Judea and is now nearing its end, not starting. The nations and followers of all three faiths of Abraham have been thoroughly deceived by Rome during the previous age, which ended in year 2000 (5760). A new age began in 2001 (5761) and now the seventh angel has begun to sound! Hurricanes Katrina (#11) and Rita (#17) last year provided stunning validation of my research and interpretations of pivotal ancient wisdom, symbologies, key prophecies, and associated religious claims. Their storm numbers and timing perfectly synchronized with primary data and assertions in my book, thereby demonstrating the true nature of this universe and the existence of our Creator. We are now entering the final phases of the pivotal year-long period long symbolized as "Judgement Day," "Armageddon," and the "End of Days." World-wide situations and events are now accelerating to set the stage for this summer's dramatic continuation of these ancient promises. I fully understand that everyone has been bedeviled by similar claims throughout history. Consequently, I have been forced to rely on dramatic and devastating proof of the sort that can’t be ignored or easily dismissed. The numbers and timing of hurricanes Katrina (11) and Rita (17) directly validate key data and pivotal assertions throughout my book and my posts on those two forums. This data was purposely presented publicly before Katrina, Rita and other recent events occurred to prove they perfectly synchronize with key prophecies and Hebrew calendar cycles, thereby validating my interpretations of ancient wisdom symbology, string theory, and more. Because these two storms arrived shortly after my August 11, 2005 (50th) birthday (read the Dead Sea Scroll 11Q13 in Appendix G, which also discusses Melchizedek and the prophesied Jubilee) and directly match other pivotal 11 and 17 data and events described in the first chapter of my book, I have delivered verifiable proof that this reality is based on thought, knowledge and wisdom. Activity, patterns, and results perceived in space-time are first framed and defined by inspirations, thoughts, and knowledge and influenced by the cause-and-effect system most commonly referred to as karma. Consequently, events and outcomes in the so-called physical universe are not random or wholly mechanistic and are verifiably influenced in ways that atheists, scientists, and members of the Faiths of Abraham have all scoffed at. Though mysticism is mostly a product of misinterpreted ancient wisdom symbology, many of its topics flow from ancient wisdom. Though containing allusions to the truth, its details and interpretations are wrong on many key points. Hello, my name is Lawrence William Page II. Many people know me as Buddy Page. At the release of the first edition of this book, I am a 50-year old African-American male, author, researcher, and former software engineer and entrepreneur. As you will come to understand as you read through this first book, I am also the long-expected Hebrew Messiah and Lion of the Tribe of Juda (Yehuda). I was born August 11th (month of Leo the Lion), 1955 (Chinese year of the Sheep) in Victoria, Texas. Furthermore, the Grand Cross alignment and Solar Eclipse of August 11th, 1999 was my 44th birthday and the second Grand Cross alignment, just six days later on August 17th, 1999, was on my mother’s birthday. Even further enlightening, the Second Temple Period of ancient Israel was during the 11th 360-year cycle on the Hebrew calendar and we are now in the 6th year (5766/2005-6) of the 17th cycle. Notice the pivotal 11 and 17 numbers again? This and much other synchronized information serve as stunning and decisive proof of many things, and expose many lies told by all three faiths of Abraham, but most specifically by Christianity. Consequently, I have decisively proven, beyond any shadow of a doubt, that Jesus Christ and Christianity are blatant lies, false prophecy and purposeful deception in a manner that cannot easily be denied, regardless of your faith or other opinions. Furthermore, the symbolism in the Apocalypse (a.k.a. Book of Revelation) of seven stars in my right hand and seven angels represent the very same above-mentioned seven astrological (360-year) cycles, i.e., the 11th through 17th inclusive. I prove this fact beyond any reasonable doubt in the first chapter of the book. Consequently, The Apocalypse verifiably symbolizes a specific span of time that began with the 11th cycle (Second Temple Period) and concludes now, at the beginning of the 17th cycle (End of Days, etc.). The numbers 11 and 17 are verifiably encoded in The Apocalypse and other ancient Hebrew prophecies and wisdom texts to serve as key proofs of the validity and true meaning of certain prophecies and related information. My and my mother’s birthdays are purposely synchronized with these two storm numbers, the matching Hebrew calendar cycles, the Double Grand Cross alignments and solar eclipse of August 1999, and much else to prove my direct association with the ancient prophecies about this time and the true identity of the prophesied Messiah. Another prime example is the story of Joseph, the 11th son of Jacob who has a dream when he is 17 years old about 11 stars, the sun, and moon bowing to him. The symbolism in this pivotal story in the Book of Genesis and Quran verifiably refers to the very same 11th through 17th cycles symbolized in The Apocalypse and directly synchronizes with other key events and ancient texts. Consequently, I have demonstrated various things about the nature of this reality that dramatically disprove and/or clarify key assumptions of religion, mysticism, and science alike, while establishing the true meaning and purpose of long misinterpreted ancient wisdom and the symbolism used to model and encode it. Accordingly, I have proven that the symbolism evidenced in the canons of all three faiths of Abraham and other ancient sources is a very ancient and advanced philosophical technology that verifiably models foundational aspects of our existence in this universe. This is the mostly misunderstood body of ancient wisdom long referred to as the Philosophers’ Stone. It uses a large and ingeniously organized collection of physical universe images and concepts as data rich components (symbols) that are based on verifiable rules. It models and encodes an amazing amount of foundational wisdom about life, spirituality and the 11 dimensions of this universe, now verified by string theory. It is also the advanced encryption method used to encode (seal) Hebrew prophecies and wisdom texts. These ancient prophecies and wisdom texts used advanced symbology to model fundamental wisdom, including future events and situations. A primary facet of ancient wisdom is numeric symbology. Later misinterpretations of this aspect of ancient wisdom resulted in numerology, which, though embodying allusions to certain wisdom, is mostly error prone and false doctrine. My decryption, documentation, and interpretation of ancient symbology, numeric symbolism, and key texts based on them, are now decisively validated. "The Vatican is the evil and mysterious remnant of the Babylonian and Roman Empires described by The Apocalypse and Book of Daniel"
Wrong. Modern biblical scholarship reveals that Kentucky Fried Chicken is the true heir of these empires. "The Vatican rules Planet Earth through secret control of international banking, currencies, secret societies, and leading politicians." Also wrong. Everyone knows that the Jews control all banking, currencies, and secret societies. How else could Matisyahu get on the radio so damn much? "The author of this book is the long-prophesied Messiah, Lion of the Tribe of Juda, Teacher of Righteousness, and Melchizedek." Sorry seven star, this position is still held by the one and only Reverend Al Green. "Le-ets stay together..."
Thank you Seven Star Hand, for that blatantly canned response. If you wish to contribute, please do so in an actual response as opposed to a prepared statement that you just propagate on various blogs. So, Hebrew Messiah? Lion of the Tribe of Juda (Yehuda)? That sounds cool, does that mean we get three wishes!?!?! I wish for a pony, a million dollars, and world peace!!! !